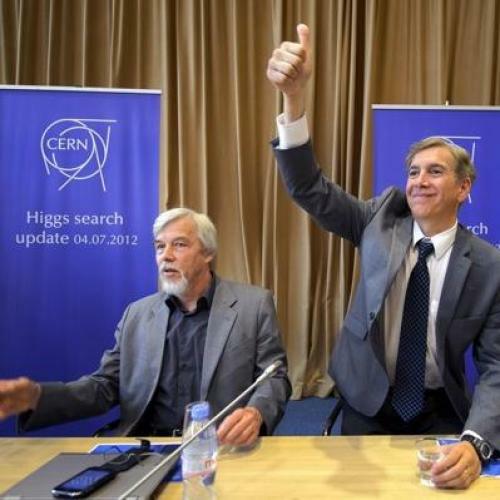 One week ago, scientists in Switzerland announced that they had likely confirmed the existence of the Higgs boson, an elementary particle long hypothesized to imbue other particles with mass. And as soon as scientists had completed their work, science journalists began doing theirs: A scramble ensued among commentators to explain for the general public just what the Higgs boson is. We couldn’t help but appreciate the lurid metaphors they came up with. Here are some of our favorites. Martin Archer, a physicist at Imperial College in London, explains it differently: He compares the phenomenon to Justin Bieber in a crowd of teenage girls. If he tries to move through them, they slow him down, and his speed decreases the more they're attracted to him. “We think we have found these teenage girls,” he told CNN Wednesday. Particles wading through the [Higgs] field gain heft the way a bill going through Congress attracts riders and amendments, becoming ever more ponderous. Without the Higgs field… all elementary forms of matter would zoom around at the speed of light, flowing through our hands like moonlight. One Higgs swimming pool (and one corresponding Higgs boson—a sort of splash in the pool) is enough to impart mass to all the particles in the Standard Model: the standard theory describing the known elementary particles and the forces acting between them. If you’ve ever walked in shallow water, you know the water seems to grab you. But fish seem to be less grabbed as they squirt through. And waterstriders skate across the top with no effect on them at all. Higgs’ field would operate something like that on subatomic particles, and the effect is what we call mass. Picture George Clooney (the particle) walking down a street with a gaggle of photographers (the Higgs field) clustered around him. An average guy on the same street (a photon) gets no attention from the paparazzi and gets on with his day. The Higgs particle is the signature of the field - an eyelash of one of the photographers. The first time we saw a giraffe, we were like, “holy crap! How could that thing be alive? How could its little heart possible work hard enough to get blood all the way up that neck to its brain?” Nobody could have hypothesized a Giraffe, it just doesn’t seem physiologically possible. Now we know it is. It’s commonplace. Sorry about the mixed metaphors.